There are a ton of games with a 2017 release date, and even more will be announced as we get further into the year. Here are just a few of the board games (in no particular order) coming out in 2017 that I’m already excited about! Have you played the fantastic game Robinson Crusoe: Adventures on the Cursed Island? Then you’re going to want to check out First Martians, because it’s built on that system. Crusoe is a co-op game that is focused on survival, so we can pretty safely assume that survival will also be key to winning First Martians. As you can imagine, the mechanics will be a bit different, because of the new setting. Another big change that has been announced is that First Martians will have an integrated app that handles the game’s balance and challenge level throughout. What’s really cool about the game and the app is that it allows players to choose whether they want to play as a single game, as a campaign where each game builds on the last, or as an open world explore mode that allows them to continue playing as long as their characters are alive. Even within those game choices there are a ton of game modes to choose from. For instance, if you decide to play a single game, you can choose from three modes: survival, scientific discovery, or exploration. We don’t know too much more about the specifics of the game mechanics, but considering that Crusoe is an excellent game, I have high hopes for First Martians. We do know that the game will be for 1-4 players and should take about 60-90 minutes to play. The game costs $75, and you can pre-order it now. If you pre-order First Martians, the designers promise that you will get the game a full month early. They also have stretch goals, so the more pre-orders they get, the more cool extras will be unlocked. Another game that caught my interest a while ago is Outlive. It made my list of the games I was most excited to see at Essen 2016. Outlive is a post-apocalyptic game set in the year 2079. Most of the world’s population has been wiped out in some kind of catastrophe, and the remaining humans have split up into four tribes. The humans have only one hope, to be deemed worthy enough to join the “Convoy,” which is a secret submarine city. The players each control one of the four tribes. The point is to try to build up their tribe by gathering resources, reinforcing their shelter, feeding survivors, gaining new tribes members, and successfully dealing with challenges (sometimes from other players), all in order to be chosen to join the Convoy. Outlive is scheduled to come out sometime around March 2017 or so. The game is for 1-4 players, takes about 40-110 minutes to play, and should cost around $60. I’m pretty excited to get my hands on this resource management/survival game. I’m specifically excited to see how players can interact with each other, and how effective people can be at sabotaging other players. 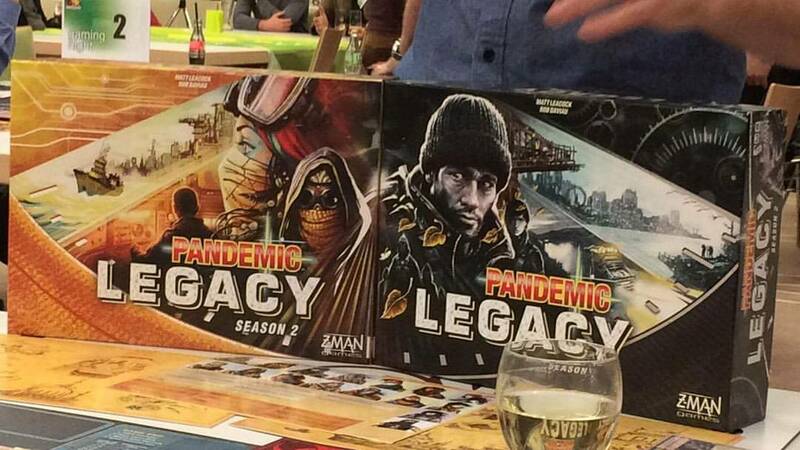 Holy crap people, did you play Pandemic Legacy Season 1? If you haven’t please stop reading this article, scrounge up a play group, and go play this game RIGHT NOW. So the details on Pandemic Legacy Season 2 are incredibly sparse. All we’ve really seen about it is a picture of the game’s box, and then a supposed picture of the game board. From those pictures people have speculated that perhaps players might have to discover parts of the world. Regardless, Pandemic Legacy Season 1, was a huge success, incredibly fun, and had a great story, so I’m super excited for Season 2. For those that don’t know, Pandemic Legacy Season 1 was a campaign version of the board game Pandemic. Progress that players made in their games carry over to their next games. The rules and mechanics also morph as you play through the season. There’s currently no word on release date, player count, or price, but considering the first game cost around $100, I speculate that Season 2 will also be in that price range. Like many of the games on this list, details about Legendary: Buffy the Vampire Slayer are extremely sparse. Pretty much all we have to go off of is a picture of an announcement banner that a reddit user posted in the boardgames subreddit. Legendary is a long string of deck-builder games, all with their own unique themes. For instance there is Legendary: Big Trouble in Little China, which put players into the roles of the protagonists from the movie, and they have to defeat the villain Lo Pan. Based on the previous Legendary games, we can probably safely assume that players will be taking on the roles of the Scooby Gang, namely Buffy, Willow, Xander, Giles, etc. There’s no word on if the game will focus on one specific Big Bad from the TV show, or if perhaps there will be multiple modules that will allow you to choose which Big Bad you go up against. No release date, player count, or price information has been announced. While I have played and not really enjoyed some of the Legendary games, I am such a huge Buffy fan that I’ll have to at least check this one out. All I can hope is that the art for the Buffy Legendary game is better than the abysmal art used in Legendary Encounters: Firefly board game. Flick ’em up Dead of Winter is a cross over game between, you guessed it, Flick ’em Up and Dead of Winter. Designer Johnathan Gilmour teased the game at Gen Con 2016. For those that don’t know, Flick ’em Up is a dexterity-based western-themed game where one side plays the sheriffs and the other plays the evil Cooper Clan. The players have to move and shoot by flicking tokens around the board. As for Dead of Winter, this game is a crazy intense zombie survival game, that is mostly co-op. Players work together to deal with challenges, like getting enough food, killing zombies, etc, all while attempting to maintain morale. But beware, because one of the players could be a traitor! Again, not much information about Flick ’em Up Dead of Winter, but the game will probably consist of players needing to fight off a zombie horde using dexterity-based mechanics. Dice Forge has a new mechanic that I’m really excited to see in action. Players will actually be upgrading and crafting the dice that they roll throughout the game, in order to try to get a better shot at victory. The point of the game is to try to acquire resources, mythical objects, and fight monsters to get victory points. I think we can assume that players will be rolling their dice to accomplish these tasks, hence the importance of upgrading their dice. I’m super intrigued by this game, and I’d love to see it in action. Personally, I am cursed with bad dice rolling luck, so I wonder how effective upgrading the faces of your dice will be. Or in other words, I have full confidence that even if I upgrade every side except one, I will totally manage to only roll the shittiest side. It will be interesting to see how much you’ll actually be able to control your fate considering that rolling dice is inherently random. Dice Forge is reportedly for 2-4 players and should take about 40 minutes to play. No word on a price or a set release date. FUSE: Flatline is a co-op dice game made by the same people that created Fuse. Flatline is a fast-paced game where each round players have to roll their dice and combine them to properly treat incoming patients. Players on have one minute to complete each round. Unlike Fuse, which gives you a set amount of time to try to combine dice to defuse a set number of bombs, Flatline will also be throwing twists at the players. Besides just treating patients, you’ll also have to deal with wounded crew members and other emergencies in the ER. Fuse was such a fantastic, simple, fun game that I’m super excited to see what’s new about Flatline. Such a fast-paced co-op is bound to be fun. Flatline is for 1-5 players, should take 25-45 minutes to play, and should be coming out sometime in March. So far there’s no word on the price. Fuse sold for $30, so I’m thinking Flatline’s price will probably be close to that. This War of Mine is actually based off of a video game, which drops players into a warzone. Like the video game, the board game puts players into the role of citizens trapped in a war-torn city who are just trying to survive. One of the big selling points of the game is that you are supposed to be able to open the box and simply start playing without reading any rules. There aren’t any victory points, just whoever survives until there is a ceasefire. The game is heavily story-based, and you’ll have to make moral and ethical decisions. Your group will need to protect your shelter, create items to help you survive and defend your shelter, and scavenge the city for resources. The designers say that each playthrough will be unique. This War of Mine is for 1-6 players and takes 45-120 minutes to play. The game was successfully Kickstarted, with an estimated delivery date of February 2017 to backers. The game cost $50 on Kickstarter, so it will probably be more than that to grab a retail copy. I’m most excited to experience the story and hopeful emotional impact of the game. The fact that you’re supposed to be able to just sit down and play without reading any rules really intrigues me. I’m pretty excited about getting my hands on this one. This co-operative real-time game has a mechanic I’ve never seen before. Admiral of the Black has each person take on the role of a pirate ship crew member who is helping pilot a pirate ship. The twist is that their player pieces are actually sand timers. When moving to a station on the ship, you have to flip your timer and then wait until the sand runs out to actually perform the action at that station. Each station will have actions like turn the ship, load the cannons, shoot the cannons, repair, etc. The game comes with 10 different scenarios, with options like a Kraken attack, a prison break, or a looting excursion. These scenarios will be available on an app that will run the game for the players. The app will actually save the game state for later sessions, and it will handle doling out random events and help with the different scenario data. The app will also be the game timer. Each game will be about 2-3 rounds, and each round lasts for 5 minutes. I’m definitely interested to see if the game is actually fun and exciting, or if it is basically a game built around a gimmick. Admiral of the Black is for 2-5 players and takes about 30 minutes to play. No word on a release date or a price.